If you tend to use these expressions very often, I feel you. Growing up with strict parents is no picnic. You have to follow all kinds of weird rules and live by curfews. You don’t get to do just anything you feel like. Convincing your parents to let you do what you want, is a major task to accomplish. You spend a good amount of time building up the courage to ask them. You practice the whole scenario in your head. But despite all the preparation, you get only one syllable answer NO. You get to the point where you don’t even bother asking them for permission because you already know the answer. No. Nah. Nope. Never. No way. You feel frustrated. You always already know that they won’t allow you, so you lower your expectations beforehand, but they still say no. You just can’t figure out why they don’t understand your wishes. You envy your friends because their parents are so cool with whatever they do. You get upset because you listen to everything they say, don’t get into any trouble, be all good and yet you don’t get to do what you want. You feel like your efforts are not being suitably acknowledged by your parents. And it’s not like you ask permission for something too reckless or extravagant. You just want to fit in, do what others are doing. You feel embarrassed in front of your friends as you always have to make excuses for not joining them. You think your parents don’t trust you enough. They are apprehensive about the people around you and worried about bad influences. You’ll always be a kid to them, no matter how old you get. They just want the best for you. It can be hard for them to accept the fact that you are growing so fast and you want to live independently and do things without them. You are the most important person to them, and so they just want to keep you under their shield for as long as they can. I understand it is hard to convince them to let you do whatever you want. I understand that you may feel that the way they are showing their love and care by restricting you from doing things that are considered completely normal, is really unfair. You just wish they were a bit more understanding and accommodating. When your parents are being stubborn, you need to be calm, as being headstrong in return won’t help at all. Whatever you do, don’t get angry or yell at them. Nobody likes to be yelled at, and even if you disagree with your parents, you should not disrespect them. If you shout and throw tantrums, it will cause them to shut their minds, and no matter whatever you say, they will not be convinced. Instead, try to act more sensibly. 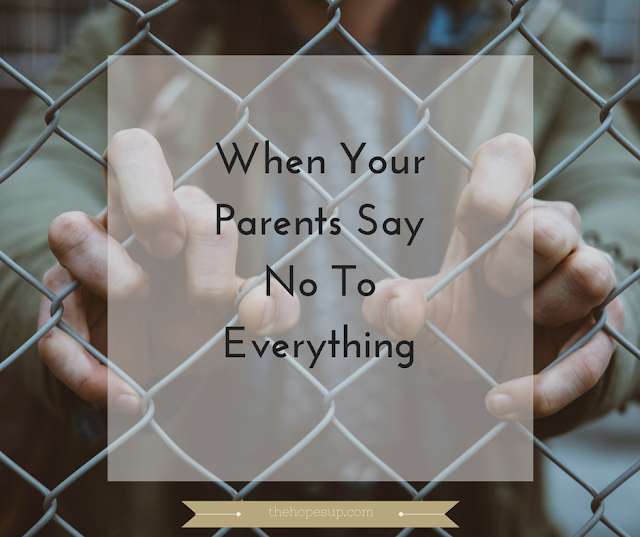 E.g., if you are upset about not getting permission to go to a party, remember that there will be a lot more parties to attend in the future, but hurting your parents just to go to a party isn’t worth it. You won’t even feel like partying when you go out after fighting with your parents. So don’t yell at them or say mean things. You will regret it later. It tenses you as well your parents. Try to be as calm as possible. Clearly, ask them why they’re saying no and then explain your point of view. If they are worried about bad influence, try getting a good friend to talk to them. Reassure them that you are in a good company and you can properly distinguish between right and wrong. Continue to foster healthy talking and you will eventually be able to get them to listen to you. Try to convince your parents as rationally as you can. I know how stubborn parents can get. But you need to keep trying to meet them halfway. Even if they say no to a particular thing, they will say yes to other things. Don’t get mad when they don’t agree to your requests every time. My parents were really strict. They never allowed me to go out. I used to be really angry at them because they didn’t give me the kind of freedom my friends enjoyed, but eventually, I learned to be more rational. I talked to them calmly even when they said no to me repeatedly. I soundly explained them my perspective, my viewpoints and how their constant refusal of my wishes affected me. Although it didn’t completely transform them and they didn’t just agree to everything I asked for, they did soften up. The number of times they said ‘No’ to me definitely decreased. Let’s say if I asked for permission to go out with my friends on 10 occasions, they allowed me 5 times. Initially, I used to feel bad when they didn’t allow me to go out as much as I wanted, but I was happier and enjoyed the time with my friends when they willingly allowed me. So keep trying to convince your parents calmly and I’m sure they will listen. It is a much better alternative than constantly fighting with your parents and complaining about how unfair they are being to you. You may feel that your parents are being overprotective and lucky are those kids whose parents let them do whatever they want to, but in reality, those kids may consider you lucky for having parents who care so much about you. There are kids who feel completely neglected by their parents and constantly crave for their attention. We always tend to think that other people have it better than us. But, the truth is that we are all just equally struggling with the imperfections in life, just the forms are different. Don’t be so quick to hate your parents when they say no to you. You have to help them understand your changing attitude and perceptions. So, how do you deal with your parents when they say 'NO' to you? Really it is very depressive. Who likes all time listening no. sometimes I became frustrated. I felt envy when I show my friends parents. I also want to enjoy my life in my style. I know they say no for our well. Your idea is not bad. I think I need to follow this and it will be helpful. Thanks a lot for sharing this article. I completely understand your situation. It's really hard to convince super stubborn parents, it feels really frustrating, especially when you compare them with your friends' 'cool' parents. But believe me, they will calm down and listen to you eventually, just don't disrespect them; they will get more agitated. Have patience!